Both the SAT and ACT are quite well correlated with IQ tests, so much so that you can make good guesses about someone’s IQ if you know their SAT/ACT score and vice versa. The ASVAB/AFQT is effectively an IQ test and it is certainly well correlated with “official” IQ tests like Wechsler Adult Intelligence Scale (WAIS) and Stanford-Binet. 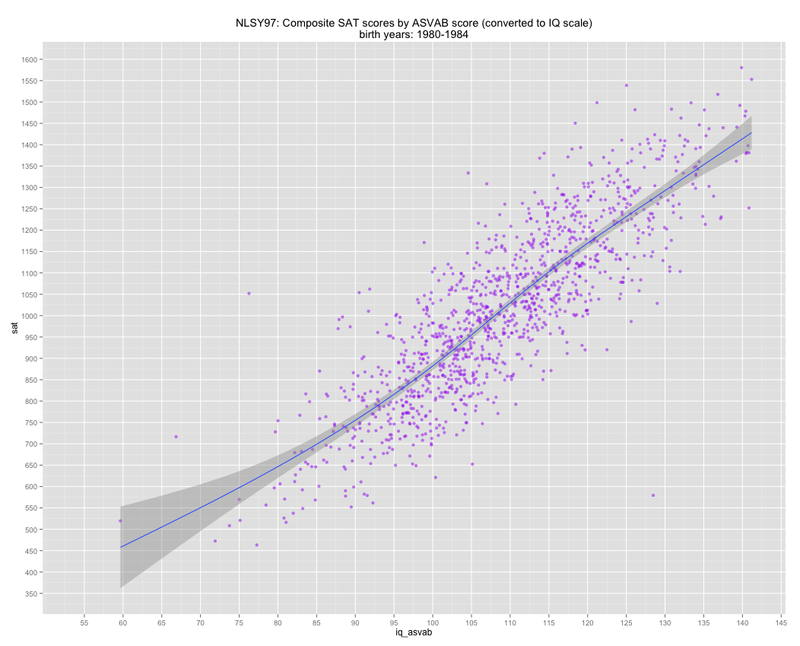 Given the strength of the correlation between ASVAB and SAT/ACT and similarities in design, the correlations between these “aptitude” tests and WAIS or Stanford-Binet are probably very similar, especially without range restriction effects and without these tests being spaced apart by several years in some cases (consider that the ASVAB-SAT r=0.85 whereas PSAT-SAT r=0.90…. pretty close). Of course, there is not one true “IQ test” and different tests have different strengths and weaknesses. Other people have studied this question using NLSY79 (the older NLSY study) and compared to other psychometric tests too. Of course, just because these tests are well correlated in general does not mean that one cannot make incrementally better predictions with additional information or, at least, adjust the confidence level accordingly. It seems to me that people that “slack off” in school, as determined to lousy GPAs despite high IQ, are significantly less likely to earn SAT scores commensurate with their intelligence (especially at the upper ability levels). That’s not to say that that makes the SAT a worse predictor for admissions purposes though! I used the NLSY97 dataset, which provides test scores and a lot of other information at an individual level for a (mostly) nationally representative cohort of people born between 1980 and 1984, for this analysis. 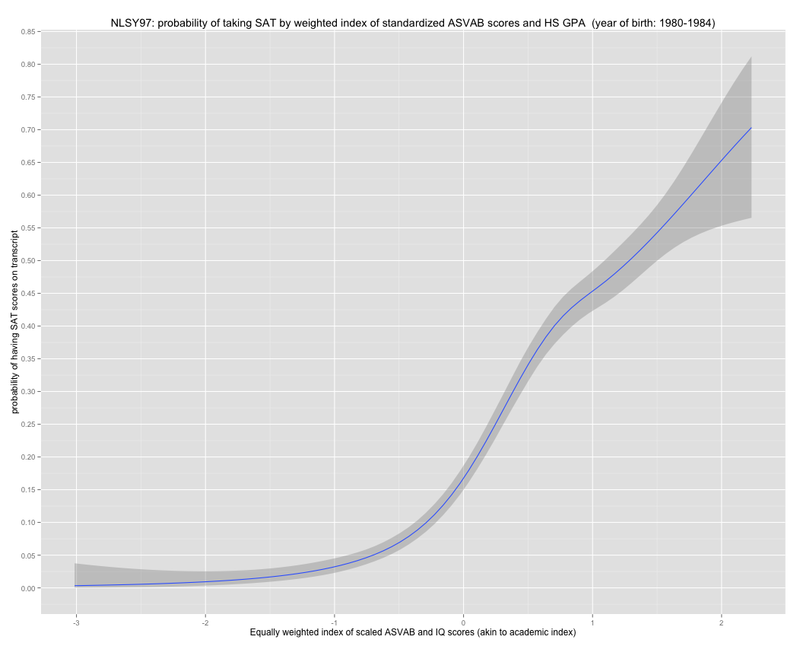 I converted the ASVAB score percentiles to IQ scores whereby 50th percentile = 100 IQ, SD = 15. NLSY97 oversampled some lower-IQ groups, but the percentiles were set according to national norms (which is somewhat lower than the white or the asian means in this and other data)..
On the other thread, you linked me to the GCSE study that showed that variation in scores can be attributed as follows: 62% genetics, 26% shared environment, 12% nonshared environment. This seems to be broadly consistent with the education research that I have seen, such as the Coleman Report. It seems that the results are usually that the socioeconomic status of the student matters the most, the socioeconomic status of the peers matters second most, and teachers matter third most. Beyond that, there seem to be few factors that make a big difference. It’s very much possible to me that the socioeconomic status of the student is partially a proxy for parenting and culture, and I see relatively little that policy can do to change that. On the second one, Richard Kahlenberg has done substantial work showing that integrating schools by class helps the disadvantaged children by ensuring that the majority of kids are focused on learning. http://www.aft.org/sites/default/files/periodicals/Kahlenberg.pdf He also shows that it has no effect on the middle class kids if the disadvantaged kids are below a certain level. I imagine you probably disagree with this research. If so, could you explain why? As for the third factor, I think the Chetty value added model is pretty convincing. We can debate endlessly how to get good teachers, but I know that the research shows that poorer kids usually get the worst teachers. If you integrated the schools, that problem would be addressed. You argue repeatedly that the socioeconomic benefit is primarily (or perhaps exclusively?) through parental education. Can you explain the mechanism for this? Is it just the best proxy for culture (how the child is raised)? It must be more than genetics because this relationship exists even after controlling for test scores. I wish you extracted a g factor from the ASVAB subtest scores and then did this analysis. Frey and Detterman did this when analyzing the NLSY79. Coyle extracted a g factor from the ASVAB subtests using SEM. I should have mentioned, Coyle’s extraction of the g factor using SEM was from the ASVAB subtest scores of those in the NSLY97.